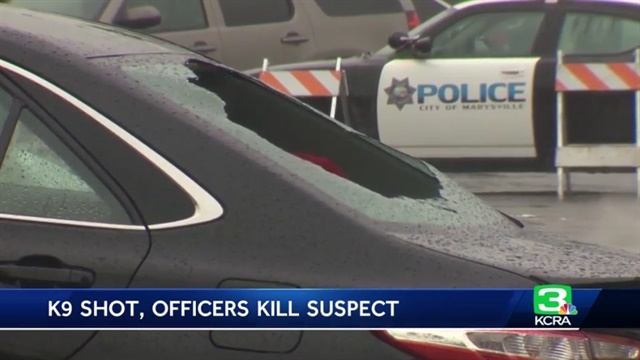 A man led officers on a high-speed pursuit through Yuba County, CA, Friday morning and then shot a K-9 in the neck before being fatally shot, authorities said. The man was identified as 26-year-old Jonathan Erick Alexander, the Yuba County (CA) Sheriff's Department said. The incident began just before 2:30 a.m. when Wheatland, CA, police initially pulled over Alexander for DUI after he was seen driving at 90 mph. The Sheriff's Department said Alexander turned off his lights and continued northbound before eventually pulling over, reports KCRA. Police say officers smelled alcohol emanating from the vehicle and the driver became uncooperative, speeding away and running over two sets of spike strips before coming to a stop. After Alexander refused to surrender and get out of the car, a sheriff's K-9 was deployed. The Yuba County Sheriff's Department said Alexander then pulled out a gun, shooting the dog. Officers then opened fire on Alexander, the Sheriff’s Department said. The bullet that hit the K-9 came out the other side of the dog's neck. He was taken to a veterinarian for treatment, where his condition has been stabilized. The K-9 is expected to survive the gunshot wound, the Sheriff's Department said. No officers were struck by the suspect's gunfire.